Script Promotion Wizard 2.5 is management & distribution software developed by Implied By Design LLC..
An automated script submission tool would be great, but because every script directory's submission process is so unique, automation is nearly impossible. 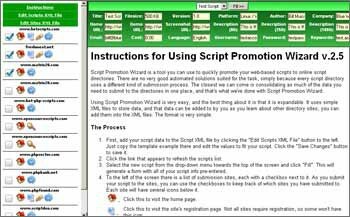 So we built Script Promotion Wizard, a free tool you can add to your web site or use on a local server that will help you manage script promotion to script directories. With Script Promotion Wizard, you can save script profiles, and add addition script directories as you learn about them. This management & distribution software is freeware, which means you can download and use Script Promotion Wizard 2.5 absolutely free. There's no need to buy the product. Script Promotion Wizard 2.5 supports English interface languages and works with Windows 98/XP/Vista. We have tested Script Promotion Wizard 2.5 for spyware and adware modules. The software is absolutely safe to install. We has completely tested management & distribution software Script Promotion Wizard 2.5 many times, written and published the interesting article and uploaded installation file (15K) to our fast server. Downloading Script Promotion Wizard 2.5 will take several seconds if you use fast ADSL connection.